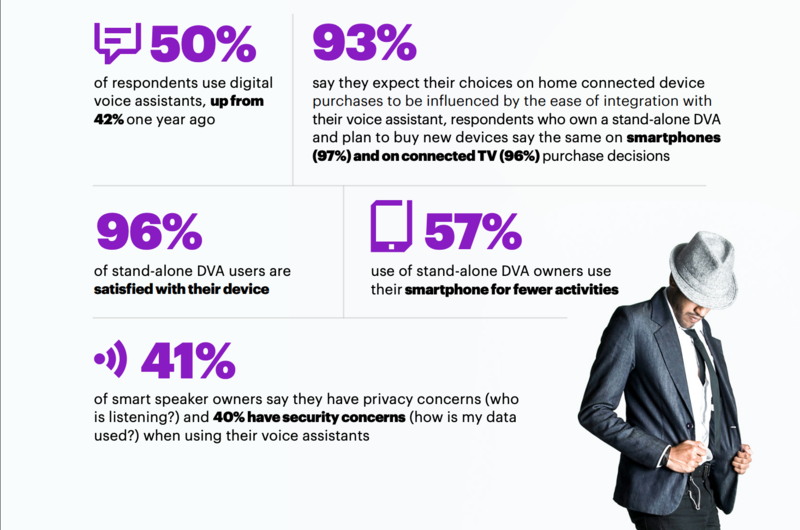 Alright, that last one seems a little out of place for things you might use your smart speaker or digital voice assistant (DVA) for, but according to a new report from Accenture, 93 per cent of respondents said that their choices for which connected home or smart home device they’ll purchase next will be determined by whether it will work with their their home DVA. So, in a way, your DVA is kind of calling the shots. Be it an Amazon Echo, Google Home or an Apple HomePod, having a DVA in the house has become a full-blown global phenomenon. In the 2019 Accenture Digital Consumer Survey, half of the 22,500 online consumers in the study said they had one (with 46 per cent having multiple), making it one of the fastest adopted technologies in North American history. “DVAs are influencing the whole consumer technology and service ecosystem in a way that no other device, including smartphones, has done before,” the study says, adding that half of standalone DVA owners reported that since getting a DVA they’re using their smartphones less. With a 93 per cent satisfaction rate among Canadians, users are tricking out their smart homes en masse with everything from Roomba vacuums, thermostats and connected lights to home appliances that preheat your oven and turn on the dishwasher, all using voice commands tied into your DVA. But these tasks are only going to get more complex and personalized and, in fact, the report suggests that consumers are ready for it. When asked, the study’s respondents said they saw a real value in the possibility of voice assistants managing everything from home security and automation to paying your bills and even providing access to virtual medical advice. As this demand increases, there’s a real opportunity for tech companies to get out in front of the trend by offering smarter, AI driven products that can integrate well with the top DVA platforms. Those that can do this successfully, and learn to cultivate partnerships with the dominant platforms, will be the ones to control the ecosystem. But what about privacy? One of the biggest hurdles DVAs have in keeping this momentum going is trust. The Accenture report states that 41 per cent of smart speaker owners have privacy concerns, such as whether they’re being spied on and who is listening to their everyday conversations. Furthermore, 40 per cent of respondents shared concerns about what their collected voice assistant data is being used for. This puts additional pressure on technology companies to not only create smart, scalable products that can integrate and adapt to rapidly changing ecosystems, but to make sure that these products are safe, which may include developing transparency policies that gives customers control over how their data is used. One thing is certain, the integration of digital voice assistants into our everyday lives is only going to increase as new smart IoT products and services emerge and we allow them to take on more and more tasks. It’s a big hurdle to overcome, but companies able to gain consumer trust in the DVA space, while producing intelligent, adaptable products that can handle increasingly complex commands will be poised for success in one of the fastest growing categories in tech.